The Maze District and the Orange Cliffs. Josh Mahan. Harry Aurand, a petroleum geologist, believed that the best resource value for the Canyonlands province of the Colorado Plateau was its superlative scenery. While looking for oil throughout the landscape, he decided that it was more appropriate to protect the landscape under the auspices of the national park system and, in 1934, planted a seed within the Department of Interior. In 1936 Harold L. Ickes, then Secretary of Interior, presented the idea to President Franklin Roosevelt and Utah Governor Harry H. Blood, without success. In fact, he tried several more times without success, even after World War II when Harry Truman was president. Click here to read the preliminary report. The long correspondance for the creation of this federal reserve land can be read by clicking here. A chronology for this correspondance, prepared by the National Park Service, can be read by clicking here. An article from the Utah Historical Quarterly (Spring, 1965), can be read by clicking here. 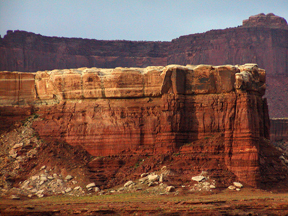 The national monument would have encompassed 4 million acres and protected the canyons of the San Juan, Green and Colorado rivers in southeastern Utah, including all of gentle beauty of Glen Canyon, which is presently under hundreds of feet of water as the result of completing Glen Canyon Dam sufficiently enough to begin the filling of the reservoir in 1963. The reason why the monument was never enacted into law, through the Antiquities Act of 1906, was due to the objections of Utah politicians. They thought this landscape was best used for extractive purposes which, through the years, has never proven to have any lasting economic value. This was the argument Harry Aurand was trying to make, even in the tough times of the Great Depression. Roosevelt did what he could in Canyon Country, by sucessfully creating Capitol Reef National Monument in 1937, which became a national park in 1971. During the administration of President Lyndon Johnson, Canyonlands National Park was created by an act of Congress in 1964, and in 1996 President William Clinton created Grand Staircase-Escalante National Monument (1.9 million acres), which is administered by the Bureau of Land Management. Click here to read an article from the Salt Lake Tribune (October 6, 1996) about Grand Staircase-Escalante NM. In 1996 Harold M. Ickes, the son of Secretary Harold L. Ickes, was Clinton's deputy chief-of-staff.